1. Slightly scrape the skin off the drumsticks and cut the drumstick into 5 cm long pieces and wash them. 2. Heat the oil in a pan and saute the drumsticks. 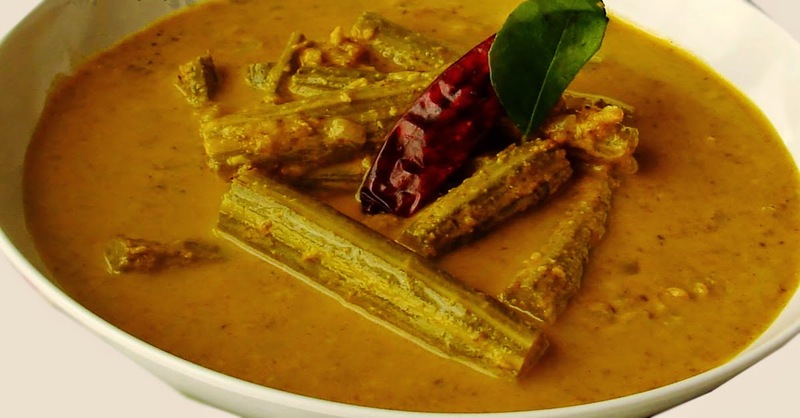 Lift them out and fry the mustard seeds and when the mustard seeds begin to pop add the curry leaves, chopped onions, green chilies, crushed ginger and the garlic slices and fry for a few minutes on low heat until the onions are caramelized. 3. Add the chilli powder and then add the sauteed drumsticks to the masala (chilli mixture) stir well and add the salt, fenugreek and the water. Cover and cook for about 20 minutes or until the drumsticks are cooked. Now add the milk and stir well and cook for about 10 minutes. When well blended remove from stove and serve.